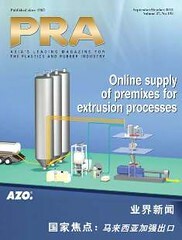 THE Taiwanese plastics machinery sector had its best year in 2011, but since then growth has braked in countries like China and India, due to the sluggish US/European economies, said officials speaking at Taipeiplas, held from 21-25 September at the Nangang Exhibition Hall, Taipei, and showcasing 475 exhibitors. Last year, was a totally different story for the industry that had a record year, with orders coming from China-based Taiwanese companies in the electronic/electrical, telecommunication and automotive sectors. As the world�s fourth largest exporter of plastics and rubber equipment, the country saw a drop in its overall machinery exports in the first half of 2012, down 2% to US$631.7 million. Its largest market, China, had a fall of 7.5% and 50% of locally made machines. �The economy is slowing down in China and it is not helped by the high labour costs and high inflation,� said David Wu, Chairman of the Plastic & Rubber Machinery Committee of TAMI (Taiwanese Association of Machinery Industry). �In the past, the Chinese government invested heavily in infrastructure, but now the costs of coal, steel and other resources are escalating. So the only markets that are doing well in China are the electrical/electronic and telecommunication sectors (especially for smartphones) but not the household goods and automotive sectors,� he added. Meanwhile, sales to Thailand, Vietnam, Indonesia and Japan showed a positive growth. Thailand, which is Taiwan�s second largest export market, witnessed a 48% increase in the first half, mainly due to orders from companies replacing equipment destroyed in severe flooding last year. On the hand, exports to Indonesia, which is Taiwan�s third largest market, increased by 4.5% in the same period, due to the stable political situation and growing economy. 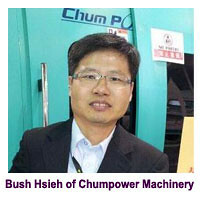 One such exporter of blow moulding machinery, Chumpower Machinery, had �good growth� in Indonesia as affirmed by Bush Hsieh, Vice Chairman of the Plastic & Rubber Machinery Committee of TAMI and Managing Director of Chumpower. �We are now working hard to explore the Myanmar market,� he said, speaking to journalists at the opening ceremony. India � still a land of opportunity? However, one official has high hopes for further sales to India. Larry Wei, Vice-Chairman of TAMI and also from Fong Kee (a manufacturer of extrusion and blow moulding machinery), said that previously Fong Kee had generated US$10 million worth of business in India, but it dropped to US$1 million in one year. 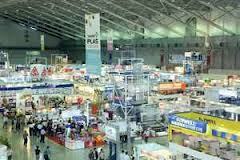 �However, we still view India as a potential market, especially for injection blow moulding machinery. Last September, we had sales of US$5 million to India but we have to compete with domestic manufacturers who are getting stronger, especially in extrusion blow moulding machines.� Wei also pointed out the cultural and language differences in dealings with Indians, as opposed to the Chinese. �It will be easier to enter the Indian market through more joint ventures,� he said. With the competition heating up, Taiwanese machine makers are differentiating their products. 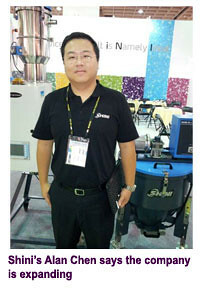 David Wu, who is also General Manager at injection moulding machinery (IMM) maker Multiplas Enginery, said that the trend is to incorporate servomotors, adding that this is �an improvement.� However, Wu contends it will be difficult to include servomotors in all of Taiwanese machines, compared to 90% of Japanese IMMs that are all-electric. This is mainly due to the high costs of the servomotors in Taiwan, which ironically come from Japan! But there is one area, where competition is possible. He explained, �Last year, Taiwan produced 15,000 IMMs valued at NT$15 billion. Japan only produced 12,500 machines but with a unit price three to four times of ours.� This, he said, allows Taiwanese machine makers room to raise the unit prices of machines and with improving quality, will place the machines on par with the competition. To add to this, Larry Wei said that more Taiwanese machine makers were introducing new products, with a focus on energy saving and eco friendly equipment. This is especially to distinguish products offered by Chinese competitors. 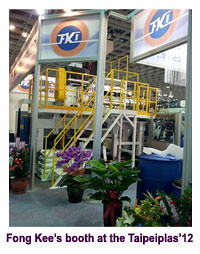 A highlight at most machine booths at the show is that the Taiwanese are moving towards providing complete solutions. Meanwhile, Michael Wang, Vice-Chairman of the Plastic & Rubber Machinery Committee of TAMI, also said that Taiwanese players were no longer focusing no pricing but on other factors such as quality and precision. 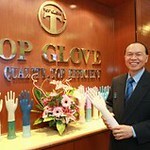 David Wu of Multiplas pointed out that a new trend is to offer turnkey solutions, instead of just selling machines. In fact, at its booth, Multiplas showcased a complete solution with the machine, mould, take-out robot and final packaging of the end product. The machine was demonstrating the production of a screwdriver in TPU in a two-colour process with one machine producing the blue coloured part, another the grey part and the third machine, the casing for packaging the screwdriver. 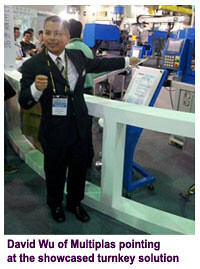 The production cell was complemented by a six-axis robot and CCD camera inspection system. Typically known for supplying machines for making golf balls, where it claims a market share of 80%, Multiplas has been seeing an increasing demand for its IMMs to smartphone makers. And it is for this reason that the company is setting up a new factory in Taoyuan. �We have bought a 300,000 sq m piece of land and the factory will be completed by 2014,� said David Wu, adding that the new facility will increase capacity by three times from the 3,600 machines/year the company currently produces. �Our sales to smartphone OEMs (Apple, HTC and Samsung) and suppliers has increased by 50% recently,� said Wu, adding that the 3C industry accounted for 40% of the firm�s sales. Another company that is riding high on the iPhone Apple demand is auxiliary equipment maker Shini. �Our business in China has slowed down by 15% this year. But the smartphone sector is still growing and this is where we are getting new orders for our equipment,� said Alan Chen, Marketing Director, adding that the firm had a turnover of US$100 million last year. Shini is also expanding to India with a facility to be commissioned in Mumbai by next year through a joint venture partner. It also recently bought a 9,000 sq ft warehouse in Orlando, US, which is expected to start up next year. Plus, Chen said that Shini is planning to set up a technical centre/branch office in Germany �but we have not decided where to open it yet.� This is being planned for next year.